Having just joined the Thorn Tree forum, the official Lonely Planet travel forum, where lots of good travel advise and information can be found, I stumbled over a prolific poster there, Tezza, who runs a couple of blogs, one about beaches and islands in Thailand and on this specific blog, he has a great post about not drowning during your Thai holiday. You may think, what is all this about and it won't concern me, but have a look and read up on it, he talks about rip tides and undertows and this should be required reading for everybody visiting Thailand, especially during the rainy season, when the likelihood of these rip tides is greatest! This includes you potential Divemasters and Dive Instructors out there, read up on this! It's a subject I was about to write about somewhere in the near future, since the rainy season is about to start, or should I rather say, started already with a vengeance, see my Samui weather blog for more info, and a few weeks ago I already took this picture in front of Centara Samui hotel in Chaweng, a big warning sign on the beach, warning you about potential rip currents. 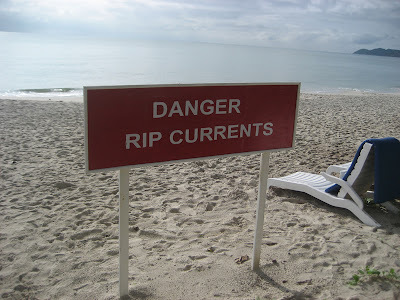 Each year, more people than you can imagine drown on Samui beaches, mainly Chaweng and Lamai beach, due to these rip currents and they don't make the international headlines! Main victims are elderly people who get caught up in rip currents and who either don't have the strength or knowledge or both to get out of them rips. So, Tezza, thanks for the informative post and I hope that plenty of people will read it.